Tinkatolli Tips - Tinkatolli News & Tinkatolli Guides 2013: Site going Under Construction! I want to announce that the blog is going to be under construction for 1 full day on Thursday the 23th 2012. We want to make the site faster, and maybe making some new designs that makes the blog look cool! We also want to make somenthing that allows the authors of this blog post easier during the school time! Unfortunately, we cannot finish the New Tinka Guide this month due to school, but we promise we will finish it as soon as we can! 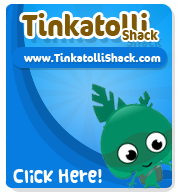 Until then, keep visiting us for the latest Tinkatolli news!